This Sunday, I briefly met up with those doing the Chuck and Crista ride out of Hains Point. They were going the opposite direction from me, however, so after a couple of miles I left the group and pedaled the Quickbeam out to White’s Ferry via the C&O Canal. It was a stunning day to ride the towpath. Have you been out there lately? It’s just gorgeous. 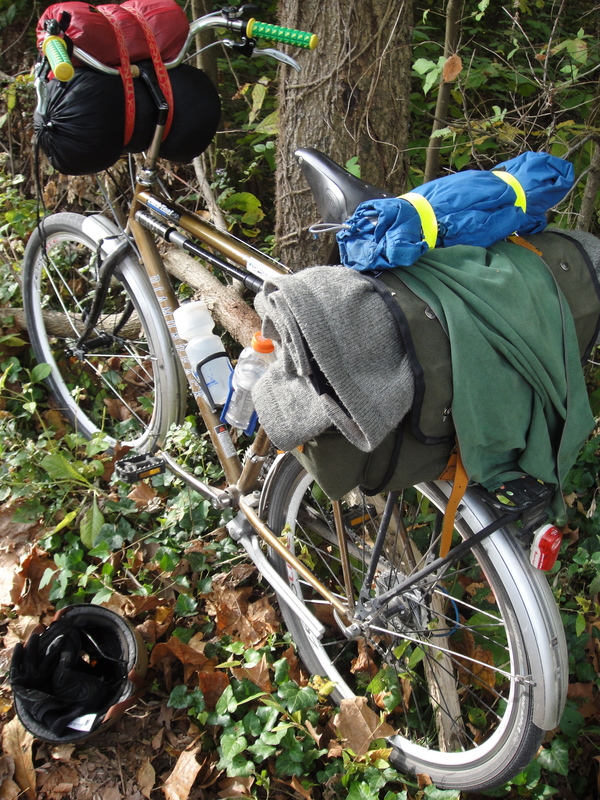 The C&O was a great choice for a Sunday ride, and the Quickbeam made for a perfect bike selection. The ever-so-slight uphill grade as you ride west requires virtually no shifting so one gear is all a person needs. I expected the C&O to be crowded with cyclists, runners, and walkers, but I was pleasantly surprised to find it moderately trafficked. Around mile marker 7, I spied a cyclist taking a break along the side of the path. He was using a Carradice bag and had an interesting bike setup so I just had to stop and talk with him! 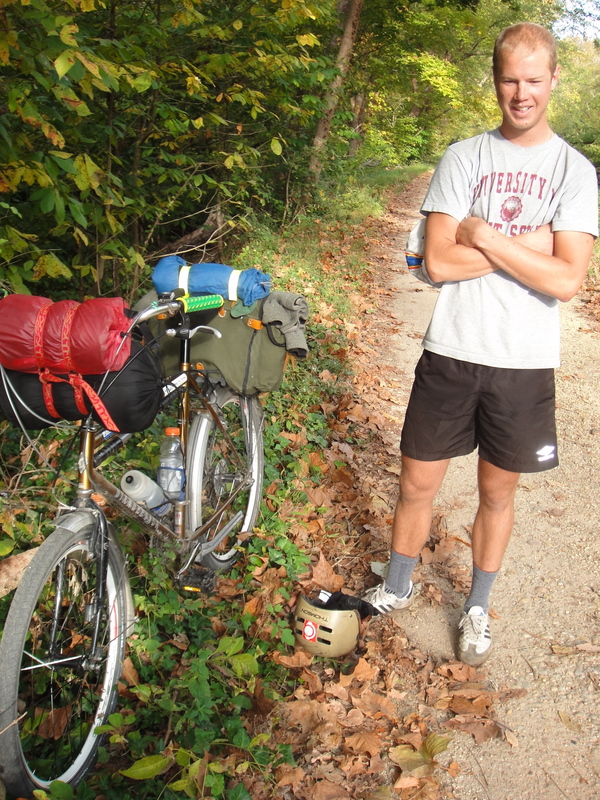 Nick, a touring cyclist from Washington state, was just finishing up a five-day tour from Pittsburgh, Pa. (He took the Alleghany Trail to the C&O, of course!) He told me that a week from now he and his girlfriend will be starting a major tour, riding from Washington state to Mexico. Wow, that sounds so great! Nick sounded like a serious touring cyclist who was quite adept at camping and cooking. Being a credit card tourer, I envied his skills. He also reported that he has read The Daily Randonneur, which of course I found quite exciting since one of my favorite people in the whole world is the author of that blog. Here is another picture of the bike with a better view of his Carradice Camper. So nice! Felkerino and I have a black version of the Camper that we took on our recent tour and it worked great. Those bags are like magic hats. They don’t look that big, but you can fit an amazing amount of stuff in them. And check out those wheels. Nice and sturdy! After a good talk with Nick, I left him to finish up his seven remaining C&O miles, and made haste toward White’s Ferry. The Quickbeam and me on White’s Ferry. One dollar, baby! I ended up taking the Ferry to Leesburg and making my way back home via the W&OD Trail. 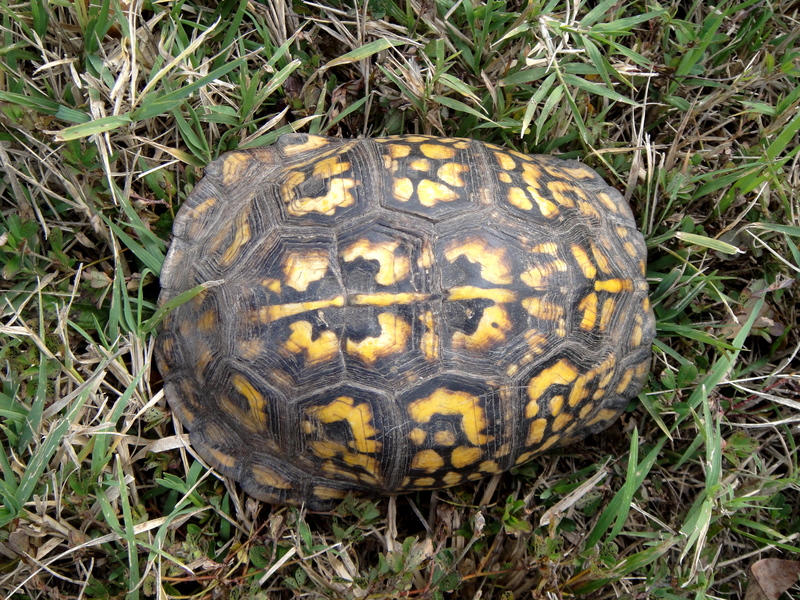 It was not nearly as beautiful as the C&O, but I did save a turtle’s life by removing it from the center of the trail. Ok, maybe I didn’t save its life, but I was helping it out. It did not seem to agree. This turtle is mad at me! It was a great ride. Perfect weather, met up with friends, rode through the fall color, met a cool cyclist, and saved a turtle. Not bad for a Sunday ride! Farmers’ Market and a Rivendell Romulus!